How does Gamut do it? To start with, the speaker has a 7" Scan-Speak, paper-fiber mid/woofer with angled radial “slices” which, according to Gamut, help dissipate unwanted resonances in the cone. Gamut also treats the cone with a special oil to help mitigate a dry, papery quality it believes is present in untreated cones. The tweeter is a Scan-Speak 1.5" ring-radiator with a custom phase plug. The crossover point is 2150Hz, and the slopes are not a standard, linear 6-, 12-, 18-, or 24dB-per-octave types; rather, the slopes start at 6dB then get steeper, so as they approach complete roll-off, they are 24dB, says Benno Meldgaard. Meldgaard also told me that this yields the best melding of frequency and phase performance. The cabinet has a rear-firing reflex port tuned to 35Hz. The cabinet is made from 21 layers of hand-selected, real wood sheets to provide stiffness, constrained layered resonance control, and relatively low mass. The curved sidewalls are glued and pressed under high temperature and pressure so that the resulting arc does not have any internal stresses. Gamut says this permanent curve is essential to achieving the kind of ridged, low-resonance performance it needs for the overall design to work. The cabinet is low mass because Gamut believes that high-mass cabinets—even well-damped ones—still retain unwanted resonances, and they radiate them “later” than lower-mass cabinets do. Apparently, listeners subliminally perceive this delayed resonance releasing as a phase smearing, and therefore as less realistic sounding. 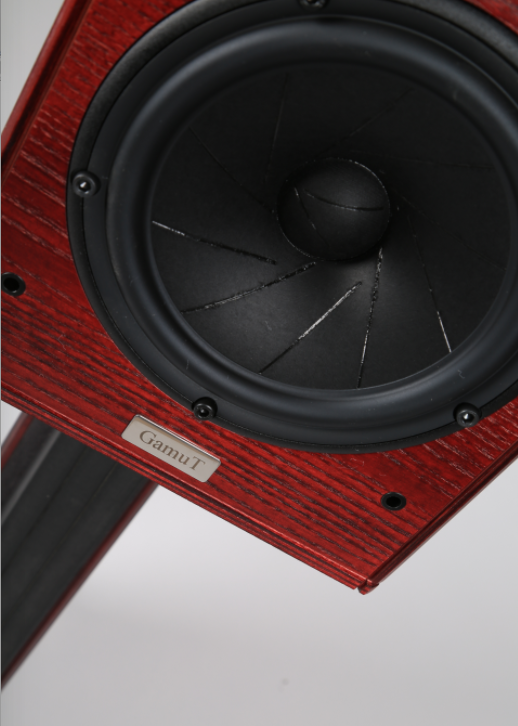 Gamut uses real wood layers for another reason: The company believes they help its speakers sound more like real instruments than synthetic materials or metal. I am agnostic on this materials point. I find Magico and YG Acoustics speakers, made with aluminum cabinets for example, to sound damned good. All I can say, here, is the Gamut RS3i sounds marvelous, and so do Magicos and YGs. Gamut asserts that internal cabinet damping materials should be kept to an absolute minimum (or eliminated altogether in the case of Crystal Cable’s Arabesque speakers) because those materials also tend to dampen the overall presentation, thereby robbing music playback of immediacy and dynamic vibrancy. In fact, this approach is a key factor in the RS3i’s design—the one that probably most accounts for its dynamic liveliness. All but a few dynamic, cone ’n’ dome speakers have several sheets or patches of internal cabinet damping materials such as fiberglass, foam, wool, felt, or cotton batting inside their cabinets to help absorb the backwaves of the drivers. But Gamut’s layered, real wood, low-mass, curved cabinets enable it to use very little damping material because its design minimizes internal standing waves and dissipates resonances quickly. In fact, each RS3i pair has a designed right and left speaker not because the respective speaker’s tweeter and mid-woofer are aligned off the vertical axis, but because one sidewall has some internal damping material while the opposite side has none. I must say, Gamut is on to something. The RS series Gamuts I’ve heard (and Arabesques, for that matter) all share a musical verve that does remind me of music’s natural dynamic presence. Some planar speakers have some of this quality as well—as they skip the cabinet altogether—but the planars I have heard don’t have as much dynamic range or palpable impact as the RS3i has. Mind you, a good planar might, arguably, also have a more refined treble presentation, but I never thought the RS3i’s upper frequencies sounded ragged, harsh, or crude. Meldgaard has adjusted the tonal balance of the entire RS line. The RS5, for example, no longer has the midrange emphasis as Robert E. Greene noted in Issue 246. In the case of the RS3i, Meldgaard told me that he applied a shallow dip starting at about 800Hz that extends all the way up to about 9000Hz—with one speaker measured on axis at one meter. He went on to say that when he measured the combined output of two speakers playing together in a typical domestic room and at a typical listening position, he found that he needed to back off the midrange output and some of the upper frequencies to make the pair of speakers sound more natural. Now, this tonal shaping might give one the impression that the RS3i might have a recessed soundstage, a bloated midbass, and a zippy top end. Actually, it has none of those qualities. It sounds well balanced and reminiscent of live music within its range. The included stand is not only a perfect match to the beautiful cabinet visually—some friends commented just how nice the review samples looked—but it is also integral to how the speaker is designed to work. The stand employs combinations of metal, layered wood, and what looks like a wood/resin material similar to Panzerholz. It has a cable routing slot running up the back and stainless steel outriggers with large threaded footers to allow for more than an inch of vertical travel for height adjustment, irregular floor leveling, and back and forward tilting. This ability to affect front/back tilt is key to expanding the speaker’s overall vertical soundstage zone—not just the top limit of the soundfield’s height, mind you, but the ability also to make the bottom of the soundstage descend quite a bit below the plane of speaker cabinets’ bases. The outriggers have small Delrin, rubber-tipped set-screws to lock in the spike level settings and to help dampen resonances between the floor and the stand. The substantial spikes are easily adjustable from the top with a hex wrench, a nice touch; Gamut also supplies matching spike cups to protect non-carpeted floors. At $19,990 for a pair of RS3is, there are a few other even more expensive stand-mounted speakers on the market. I don’t have experience with any of them in my own system, but I have heard the following models at audio shows (all prices including dedicated stands): Raidho C-1.1 ($18k) and D-1 ($28.5k), the TAD CE1 ($24k) and CR1 ($42k), the Magico Q1 ($26,500-$28,995), and the MBL 120 ($23,030). The two TAD models also had wide dynamic ranges, but tended to inch toward sounding a bit dry and matter-of-fact. They are both three-way designs, by the way, and cost more—$22,010 more in the case of the CR1. The Raidho models sounded very accurate and musically enjoyable, but I am not sure how much dynamic power the Raidho quasi-ribbon tweeter can handle to allow them to really rock out, as it were, like the RS3i can. I don’t believe I heard the low bass extension from either the Magico Q1 or the MBL 120 that I have been getting from the RS3i, but there are just too many variables to make much of my impressions here. I also am not at all sure how well the RS3i might stack up against the others in terms of fidelity to sources and upstream electronics. My point is that the RS3i has plenty of price company in the deluxe mini-monitor category and may, actually, be price competitive. The RS3i sounds like a musically accomplished speaker that just happens to be small. While I believe the RS3i renders upper frequencies quite well and is indeed quite extended and complete sounding, I suspect even greater refinement and resolution of fine details and textures may be available from other über mini-monitors such as the Raidhos and Magicos mentioned above. My speculation along these lines comes from hearing the other speakers at audio shows, as mentioned, and so it is a “hunch” and should be taken as such. Another caveat: The RS3i stand’s outrigger set-screws, while a clever feature, could have been mounted at an angle to make for easier user access. The shipping crate is quite large because it houses both the speakers and their attached stands. Two smaller crates (one speaker and stand per crate) would be more easily maneuvered for unpacking, storage, repacking, and shipping. Most of my nit-picks are purely matters of convenience. I had to really search to come up with a few things to criticize, lest I lose some credibility. From the moment I first connected the RS3i without much regard to optimizing its placement and just let music play, I heard something compelling about the speaker. It only got better with time and fine-tuning. Its liveliness never proved less than entertaining and engaging. In fact, the more I listened to the RS3i, and the more albums I threw at it, the more I admired its winning ability to dig bring out the music’s essence and do so with a beguiling joie de vivre. Its bass extension and dynamic power are up there with the best of the mini-monitor breed. The RS3i combines all the advantages of a small stand-mounted speaker—illuminating imaging and wide-open soundstaging—with stunning dynamic presence. Capable of sounding much bigger than it looks, it is a honey of a speaker and should be on anyone’s short list for a small-to-medium-sized rooms. Enthusiastically recommended. Dimensions: 8.9" x 41.7" x 18"